And so it begins. The 2012 recruiting board lives here. The first commit to the 2012 class is Rockford, MI offensive lineman Ben Braden. 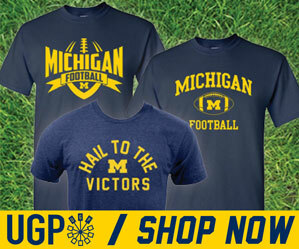 Like mgoblog points out, all three recruiting services disagree on his size. Rivals is the most optimistic, measuring him at 6-6, 285. Scout isn't far behind at 280 pounds, but ESPN calls him a mere 6-5, 250 - while simultaneously calling him a defensive tackle. I'd say ESPN, as both an outlier and the absolute worst at evaluating prospects in a reasonable time, is least likely to be accurate. Braden's probably a shade under 6-6, and around 270-280 pounds. 24/7 Sports calls him 6-7, 295, which seems like an exaggeration given all the other evidence at our disposal. I've always thought that getting trustworthy honest-to-goodness information about recruits has got to be next to impossible...and seeing the discrepancy in Braden's reported size confirms this. It's a little frustrating too that a "commitment" isn't really a commitment at all when a guy can just change his mind whenever he wants...which happens all the time (See: Dee Hart and Jake Fisher as two recent examples). Not saying that will happen here, but just sayin. Braden's offer list is good food for thought...Michigan, Wisconsin (which tells you something), Michigan State and Syracuse. As far as what this means for the rest of the class...well, there isn't a class yet, so hopefully this will trigger a slew of commits. I hope to see at least 3 or 4 OL taken in this class...if not 1 or 2 more. 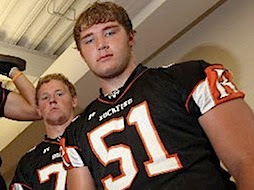 We have a solid group of OL leaving over the next couple years, so Braden, along with hopefully a few other good OL prospects will be a welcome addition to the 2012 class. I feel bad that I didn't get to see Ben play in high school. My gut hunch is that he will surpass every expectation Michigan has for his football career. Go Blue!